Whether you are a beginner or a pro paddler, having a reliable kayak is a must. This ensures that you will have a good time in the waters without worrying about your safety. If you are looking for a good kayak, the Aruba 10 or Journey 12 has been known to produce many excellent kayaks over the years. Just ask any member of their loyal customer base and you are sure to get good reviews about their products. Getting a Aruba 10 has many advantages. In this article, we are going to share with you some of the pros, the cons, as well as other important information you need to know when it comes to choosing this kayak. This is to help you decide if this kind of kayak is the right one for you and your paddling needs. Let’s begin! Benefits – What Problem Does It Solve? If you are planning to get a small boat for your water activities such as light paddling on a river or lake, the Aruba 10 sit in is a great choice. It comes with all the basic features that you need for a small boat. Also, the price is very reasonable. If you’re not planning to become a pro paddler, then getting this can give you the chance to enjoy the activities without burning a hole in your wallet. This kayak is perfect for beginners and experts alike. But it is especially compatible for people who are just starting out with their paddling adventures. Most of the expert paddlers would probably have graduated from a basic boat such as this. It is best for children, weekend kayakers, and people who just want to have a peaceful time in the river or lake. If you are looking to test nature and really feel the power of the waters, you may need something more than a basic boat. Also, if you are over 5’8”, you will have some trouble with the storage in the cockpit. These are just some of the things you should consider before buying this. Nonetheless, this can certainly provide you with an excellent experience in the waters. This Kayak has a hull design which gives it the best combination when it comes to turning and tracking. With its convenient gear storage, along with shock cord deck rigging, it also has adjustable foot braces as well as a spray deflector collar. This model is ten feet long, thirty inches wide, thirteen inches tall, and it weighs at forty pounds. It’s capacity of two hundred fifty pounds. It has all the basic features that you need to have a good time out in the waters. Made from high-density polyethylene, the Sun Dolphin can withstand underwater obstacles as well as the occasional run-ins with rocks. There may be some dents in the shell but overall, any breach would be rare. If you do see some dents, they can be easily repaired at home. When you buy this kayak, you also get a two-year warranty which ensures protection as well as your peace of mind. These two are very important features for any personal watercraft. The Sun Dolphin Aruba 10 has a narrow stern and bow, keeping it right on track. It can slice through the water and not pushing it the way those with blunt designs do. It is very light, at only 40 lbs. It can sit lightly on the water, giving you added tracking ability. The kayak is 30 inches wide with a flat bottom. These features assure the stability for any paddler, beginner or expert. It is important that you can confidently get your canoe in the water with ease. It can readily fit into the bed of your truck or on any car-top carrier. It is only 40 lbs., so you can carry it without difficulty from your vehicle to the waterside. Since this kayak is a 10-foot boat, you can expect that it has a smaller load limit. It can carry up to 250 lbs. You can find a covered storage compartment behind your seat. There is also room for gear surrounding your feet. Three main features that help in maximizing your comfort as you paddle. The first one is that it has a high back support. Second, it has adjustable food braces. These give you the opportunity to improve your paddling. And third, it has a built-in spray deflecting collar that can keep you dry. Now that we’ve discussed the pros, let’s take a look at some of the cons so you’ll have a more balanced understanding of this kayak. Be sure to consider if these are things you can have compromise on or if they are nonnegotiable. The seat on this has no padding. This can make you feel uncomfortable if you plan to be using it for an extended period. But if you only plan to paddle for a few hours, the seat won’t be a problem at all. Weekend kayakers won’t see this as a very big problem. Being a basic boat, the Aruba 10 is best to be used on flat water. This can handle the slight chops of the wakes that other boats create. However, you cannot expect it to do well with waves one foot high and up. If you want to really test the waters, it is recommended that you get a boat that is really designed to withstand those kinds of waves. Although there is a compartment behind the seat, it is only the size of a shoe box which can be quite small for most of the paddlers out there. Also, if you are over 5’8″, you won’t have any storage in the cockpit at all. This kayak is not recommended for anglers, too, as there is not enough storage. It is also not recommended to add another person or your big dog, even if it will be quite fun and tempting to do that. If you wish to take another person or your pet along, it is better to buy a twin kayak instead. The Aruba 10 is just a little over $400 at the time of this writing. In some stores, you can find prices as low as $200. So try to look around and you just might find the best deals a Aruba 10 canoe. Make sure that you ask if the paddle comes along with this so you’ll know you need to have a separate budget for the paddles. As mentioned above, it comes with a two-year warranty. Do check the unit thoroughly for any factory defects so that you don’t have to worry about how to return the product if you do find out that there are some defects. Now that you have an idea about what you’ll get if you buy this, you are more equipped when it comes to deciding if this is the right boat for you. You have to know and understand your needs as a kayaker or paddler first before you can decide on what kind of boat you are going to get. If you just want a relaxing time in the water, this boat is perfect for you. However, if you want to feel the waves and are chasing after a more thrilling experience, you may encounter a few challenges here and there because the kayak is not designed to withstand high waves. It also doesn’t have enough storage for your fishing gear. These are the things you should consider if you plan on buying this. The Sun Dolphin Aruba 10 is a good recreational kayak for any kind of paddler. It has the basic features that you need for a small boat. A plus is that it doesn’t cost so much. 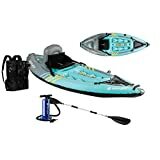 So if you are not yet ready to go pro or to spend a lot of money in high-end paddling equipment, this is the way to go. Do you consider yourself a beginner, a recreational, or a pro paddler? Knowing your skills and capacity as a paddler as well as your goals in your water activities can help you tremendously in choosing the right boat that can best fit your needs. Have you had the chance to paddle using this? How was your experience? Did it exceed your expectations or did it disappoint you? Feel free to share with us your thoughts so that other paddlers can know if this is the most suitable for them. 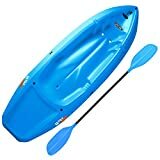 I wrote this article to serve a round-up of some of the Top kayaks available on the market to help you find your perfect kayak. Not only are inflatable kayaks ideal for camping, vacationing, or exploring remote areas, but they also provide convenience. This aspect relates to the fact that they are seamlessly easy to fit into a duffel bag or the trunk of your car, not requiring any additional storage (i.e. roof racks or canoe trailers). 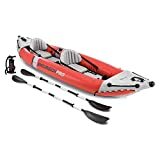 Ultimately the top pick will be the one which fits your own individual requirements, and so take the time to consider what features you’d like from an inflatable kayak.